Achieving glossy locks may seem like an elusive dream, particularly for those with dry or textured hair. The pure moisture your hair craves can be found in olive oil, rather than your collection of creams and serums. Olive oil functions as both an intensive leave-in treatment and a daily frizz remedy. Choose the right formula of olive oil to suit your hair type, and watch shiny and manageable tresses go from a daydream to reality. Extra-virgin olive oil and refined olive oil are most effective for the hair. Light formulas typically have chemical additives that can dry hair out when used in excess. Pure olive oil is thick, and provides an intense moisture and shine treatment; it is most commonly used by those with dry hair. Those with dry and damaged hair should avoid chemically altered olive oil. Extra-virgin olive oil is widely available at grocery stores. Using olive oil as a leave-in treatment will condition hair from the inside out for long-lasting shine. Coat your dry hair in olive oil from roots to tips and wrap your hair in a warm towel to help it sink in. Leave the oil in your hair for at least 40 minutes, and rinse it completely. Massage a gentle shampoo into the roots of your hair and rinse to remove any excess oil. Olive oil makes a suitable spot treatment for dry hair -- it tames frizz and adds instant shine while making split ends less noticeable. Only a small amount is needed when oil is used on dry hair. 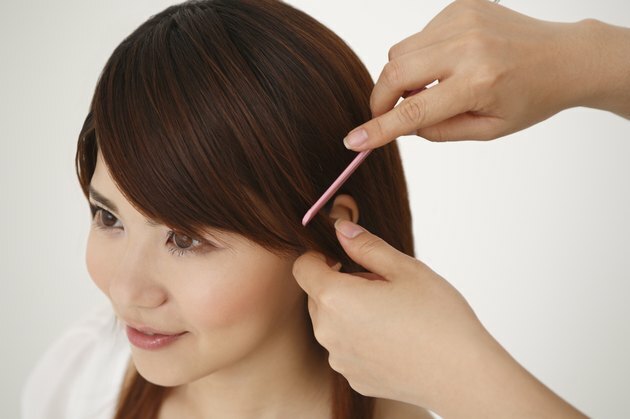 Smooth a dime-size amount through the ends of your hair only. Comb your hair with a wide-tooth comb to distribute the oil without weighing the roots down. Olive oil is most suitable for those with textured, dry or damaged hair. Those with fine hair should consider lighter options such as coconut oil or cream-based treatments. It can be difficult to completely rinse olive oil out of fine hair. If you choose to apply an oil mask to fine tresses, massage a deep-cleansing shampoo into your roots; allow it to drip down through the ends as you rinse to keep moisture intact.